Biotite is a sheet silicate. Iron, magnesium, aluminium, silicon, oxygen, and hydrogen form sheets that are weakly bound together by potassium ions. It is sometimes called "iron mica" because it is more iron-rich than phlogopite. It is also sometimes called "black mica" as opposed to "white mica" (muscovite) – both form in the same rocks, and in some instances side-by-side. Like other mica minerals, biotite has a highly perfect basal cleavage, and consists of flexible sheets, or lamellae, which easily flake off. It has a monoclinic crystal system, with tabular to prismatic crystals with an obvious pinacoid termination. It has four prism faces and two pinacoid faces to form a pseudohexagonal crystal. Although not easily seen because of the cleavage and sheets, fracture is uneven. It appears greenish to brown or black, and even yellow when weathered. It can be transparent to opaque, has a vitreous to pearly luster, and a grey-white streak. When biotite is found in large chunks, they are called "books" because it resembles a book with pages of many sheets. The color of biotite is usually black and the mineral has a hardness of 2.5–3 on the Mohs scale of mineral hardness. Biotite dissolves in both acid and alkaline aqueous solutions, with the highest dissolution rates at low pH. However, biotite dissolution is highly anisotropic with crystal edge surfaces (h k0) reacting 45 to 132 times faster than basal surfaces (001). Thick biotite sample featuring many sheets. 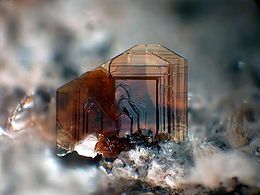 Biotite crystal exhibiting pseudohexagonal shape. In thin section, biotite exhibits moderate relief and a pale to deep greenish brown or brown color, with moderate to strong pleochroism. Biotite has a high birefringence which can be partially masked by its deep intrinsic color. Under cross-polarized light, biotite exhibits extinction approximately parallel to cleavage lines, and can have characteristic bird's eye extinction, a mottled appearance caused by the distortion of the mineral's flexible lamellae during grinding of the thin section. Basal sections of biotite in thin section are typically approximately hexagonal in shape and usually appear isotropic under cross-polarized light. Biotite (in brown) and muscovite in an orthogneiss thin section under plane-polarized light. Biotite in thin section under cross-polarized light. Sagenitic basal section of biotite with needle-like rutile inclusions in thin section under plane-polarized light. Biotite is found in a wide variety of igneous and metamorphic rocks. For instance, biotite occurs in the lava of Mount Vesuvius and in the Monzoni intrusive complex of the western Dolomites. Biotite in granite tends to be poorer in magnesium than the biotite found in its volcanic equivalent, rhyolite. Biotite is an essential phenocryst in some varieties of lamprophyre. Biotite is occasionally found in large cleavable crystals, especially in pegmatite veins, as in New England, Virginia and North Carolina USA. Other notable occurrences include Bancroft and Sudbury, Ontario Canada. It is an essential constituent of many metamorphic schists, and it forms in suitable compositions over a wide range of pressure and temperature. It has been estimated that biotite comprises up to 7% of the exposed continental crust. An igneous rock composed almost entirely of dark mica (biotite or phlogopite) is known as a glimmerite or biotitite. Biotite may be found in association with its common alteration product chlorite. The largest documented single crystals of biotite were approximately 7 m2 (75 sq ft) sheets found in Iveland, Norway. Biotite-bearing granite samples (small black minerals). Gneiss sample bearing biotite and chlorite (green), a common alteration product of biotite. Biotite is used extensively to constrain ages of rocks, by either potassium-argon dating or argon–argon dating. Because argon escapes readily from the biotite crystal structure at high temperatures, these methods may provide only minimum ages for many rocks. Biotite is also useful in assessing temperature histories of metamorphic rocks, because the partitioning of iron and magnesium between biotite and garnet is sensitive to temperature. ^ Malmström, Maria; Banwart, Steven (July 1997). "Biotite dissolution at 25°C: The pH dependence of dissolution rate and stoichiometry". Geochimica et Cosmochimica Acta. 61 (14): 2779–2799. doi:10.1016/S0016-7037(97)00093-8. ^ Hodson, Mark E. (April 2006). "Does reactive surface area depend on grain size? Results from pH 3, 25°C far-from-equilibrium flow-through dissolution experiments on anorthite and biotite". Geochimica et Cosmochimica Acta. 70 (7): 1655–1667. doi:10.1016/j.gca.2006.01.001. ^ Bray, Andrew W.; Oelkers, Eric H.; Bonneville, Steeve; Wolff-Boenisch, Domenik; Potts, Nicola J.; Fones, Gary; Benning, Liane G. (September 2015). "The effect of pH, grain size, and organic ligands on biotite weathering rates". Geochimica et Cosmochimica Acta. 164: 127–145. doi:10.1016/j.gca.2015.04.048. ^ Faithful, John (1998). "Identification Tables for Common Minerals in Thin Section" (PDF). Retrieved March 17, 2019. ^ a b Luquer, Lea McIlvaine (1913). Minerals in Rock Sections: The Practical Methods of Identifying Minerals in Rock Sections with the Microscope (4 ed.). New York: D. Van Nostrand Company. p. 91. ^ Carmichael, I.S. ; Turner, F.J.; Verhoogen, J. (1974). Igneous Petrology. New York: McGraw-Hill. p. 250. ISBN 978-0-07-009987-6. ^ Nesbitt, H.W; Young, G.M (July 1984). "Prediction of some weathering trends of plutonic and volcanic rocks based on thermodynamic and kinetic considerations". Geochimica et Cosmochimica Acta. 48 (7): 1523–1534. doi:10.1016/0016-7037(84)90408-3. ^ Morel, S. W. (1988). "Malawi glimmerites". Journal of African Earth Sciences. 7 (7/8): 987–997. doi:10.1016/0899-5362(88)90012-7. Wikimedia Commons has media related to Biotite.